Aromas of hibiscus and chai fill the air as you walk through the doors of the Heritage Tea House & Café located at University and Western Avenue N. in St. Paul. Run by Raeisha Williams, the tea house first opened its doors in December 2017, although it’s been a dream of hers for quite a while. Offering a full menu of healthy soul food options, tea and liquor, the tea house’s couches and tables provide a wide array of seating choices and a comfy atmosphere to those who want to enjoy a relaxing meal or just some tea. Photographs of Williams’ family are scattered across the wall of this cozy spot where locally- made African crafts are offered for sale on the back wall. The MSR sat down with Williams (RW) for a Q-and-A session about the tea house and the legacy she’d like to leave behind. MSR: What inspired you to become a business owner? RW: My mom and grandma. For as long as I can remember they’ve been business owners. They co-owned a floral and African gift shop on 38th and Nicollet for most of my childhood. Just being there with them, helping them with floral design, running the register inspired me the most. Also, seeing the difference between business owners and workers and how the success paid off. MSR: Why a tea house? RW: We knew we wanted to be small, we knew we wanted to be intimate, we knew that we wanted to have things that we loved, and my family traditionally has loved tea. Oftentimes people don’t think of tea as African American culture, but it is. There are so many articles that date back to the early 1800s where affluent African American women-owned tea houses. 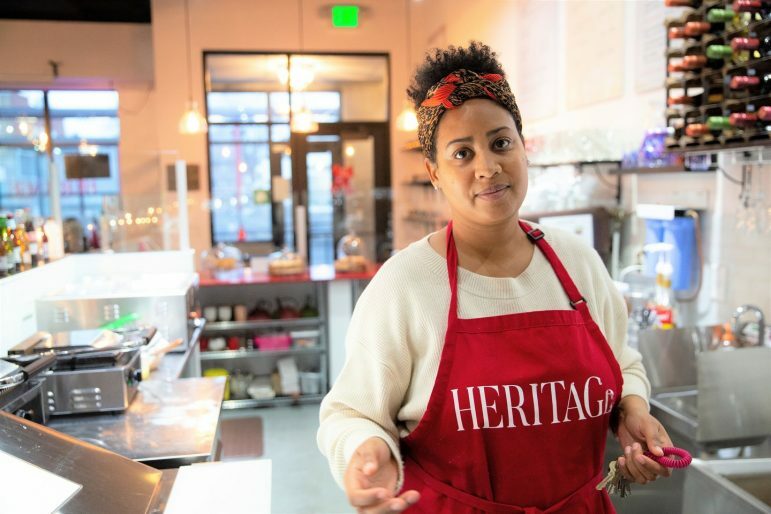 So just continuing that tradition is sort of re-emerging that tradition of tea houses owned by African Americans — it’s actually happening nationwide. MSR: Have you owned any other businesses before the Heritage Tea House? RW: I’m a serial entrepreneur, so I’ve had a few other businesses prior to the tea house. The first business is a consulting firm, Doll Face Media — we do marketing and PR. The second business is a lash bar on Broadway in North Minneapolis. MSR: What do you think your failures and successes have been so far with running businesses? RW: My successes early on were in college. I was able to learn the process of incorporating and also the importance of having an accountant. That prepared me as much as you possibly could about processes like tax forms and licensing. One of the failures would have to be not doing enough advertising in previous businesses. We’ve had huge success by word-of-mouth and social media, but we neglected a lot of other advertising and marketing aspects. MSR: What are the struggles with running a business? RW: I think our biggest struggle has been not having enough capital. Initially, when we got our financing, we knew we were going in on a shoestring budget. I think that we underestimated how tight the budget was going to be and how much more capital we should have asked for [from the business loan]. I think a lot of times minority businesses just try to get the doors open. We’re so used to doing things on a shoestring budget, and I think that’s to our deficit. MSR: What differences do you see between minority and White businesses when starting out? RW: I’d say capital, big time. We have a low rate of being able to raise funds from funding sites, for one example. Through systematic racism, we also haven’t been able to get the bank loans we need. When you don’t have the capital to start a business or you have the capital to start a business but not to maintain it, that’s when our businesses fail early on. MSR: How has the community supported you? RW: The community has been really happy we’re here and really receptive and supportive. That has been our main customer base. We just got to get out there more and let more people know that we’re here. MSR: How do you feel you’ve impacted the community? RW: I think very positively. It offers the community another space. MSR: What’s your vision for where you want to take the business? RW: The next course of business would be producing a tea line. Our tea line will offer hibiscus punch bottled and a few other bottled products. We also want to expand to Minneapolis. MSR: What advice do you have for aspiring entrepreneurs? RW: I would encourage any aspiring entrepreneurs to, even if you don’t have the capital, even if you don’t know how you’re going to get it started, start doing your research, start preparing that administration piece, start just building. Before you know it, your business will be up and running. MSR: What legacy do you want to leave behind? RW: I want to create a legacy of Black businesses. Historically, we’ve had conglomerates and communities of strong businesses. We’ve had banks, we’ve had our own butcher, we’ve had these things out of necessity. If you look at other communities — particularly immigrant communities and communities of color — they work together as a community and support each other’s businesses. My goal is to rebuild African American businesses that are high quality in every possible way in the community. We don’t have to go outside of our community to enjoy things like a nice quality restaurant, for example. The Heritage Tea House & Café is open Monday through Friday, 11 am to 6 pm; Saturdays, 11 am to 4 pm; and Sundays from 12 pm to 4 pm. Now through January 15, MSR readers can receive a 10 percent discount by mentioning this article. So glad Raeisha that you’re following in your families footsteps and contributing a space for artistic expression and thriving business that celebrates our rich culture!